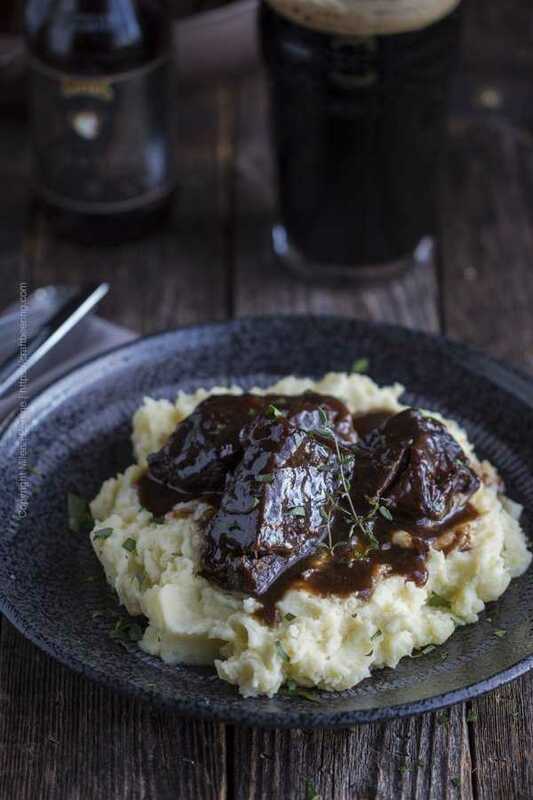 Beer braised short ribs are cooked low and slow, infused with rich, deep flavors and smothered in a luxurious gravy made from the braising liquid. Plus, you will be impressed by how easy this dish comes together relative to how immensely satisfying it tastes. Cooking with beer at its finest, especially if you use a roasty, sweet dark ale. Da beef short ribs are number one of course. This (Chris’) recipe works perfectly with both bone-in, English cut short ribs and boneless beef short ribs. 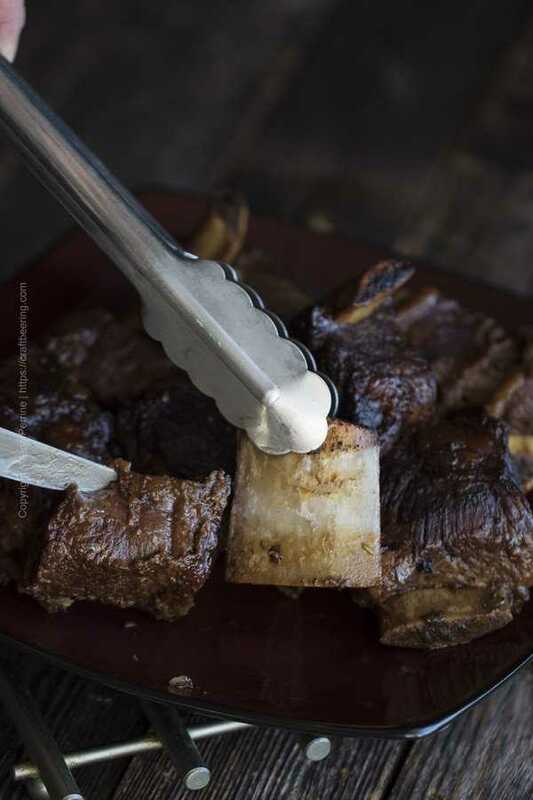 As a refresher the short ribs are part of the ‘chuck’ section of the animal, they are the first five rib bones and are quite short relative to the rest of the ribs, hence the name. If you find boneless – all you will have to do is braise them and they will be ready to serve. 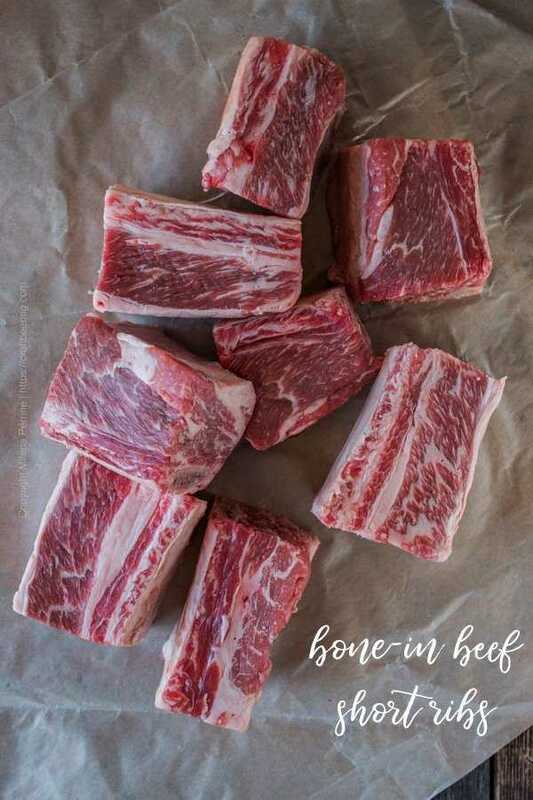 If you buy bone-in short ribs, you will perform one (optional, but highly recommended) step at end – removing the bones and tendons. 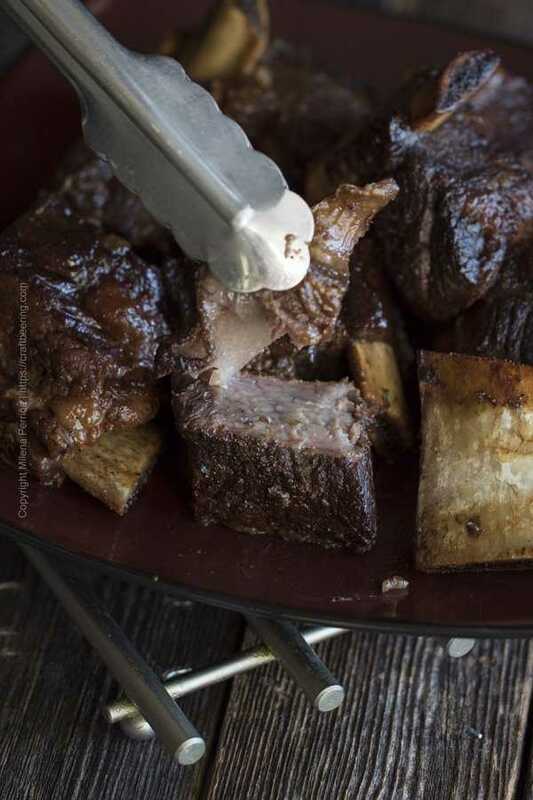 This style of ‘chunky’ cut bone-in short ribs is known as English cut. It is all about the flavor it will impart so choose wisely. We recommend styles brewed with dark malts in the grain bill. Think styles such as dark lagers (dunkel or schwarzbier), brown ales and especially stouts and porters. The more malt forward and roasty, the better. 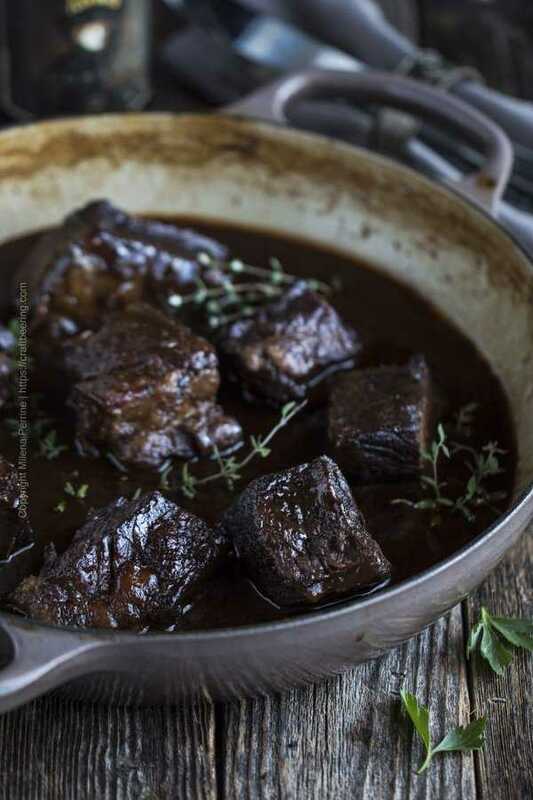 For best results use a braiser or a large Dutch oven or similar cast iron braising pot with lid and cook the short ribs in your oven. We are partial to and recommend this method. (If you don’t have a braiser/large Dutch oven or similar you can use a deep, heavy roasting pan and cover it tightly (no moisture should escape) with heavy duty aluminum foil to simulate a lid, they will braise just fine). Alternatively, you can use a large pan to perform the initial steps to the recipe and then transfer all the ingredients to a large slow cooker and cook them there. Consult the recipe card for details. As a refresher – braising is a technique in which meat is first seared and then slowly cooked in a flavorful liquid, at low temperature. Braising (aka pot roasting) is largely hands off, but you need to give it time to work its magic and reward you with juicy, flavor infused, fall-off the bone tender meat. Start by giving the veggies a rough chop. Set them aside. Next generously season the short ribs with salt and pepper. Be sure to pat them dry first with a paper towel. Brown the short ribs on all sides as shown above. Work in batches so you don’t overcrowd the pan and move them to a plate. Set aside. Next, in the same pot/pan soften the roughly chopped veggies, about 5 minutes, and then add the tomato paste and flour and stir. Cook for a minute and deglaze the pan with the porter (or beer of your choice). Add the beef stock, the fresh herbs and bay leaf and stir in the brown sugar. 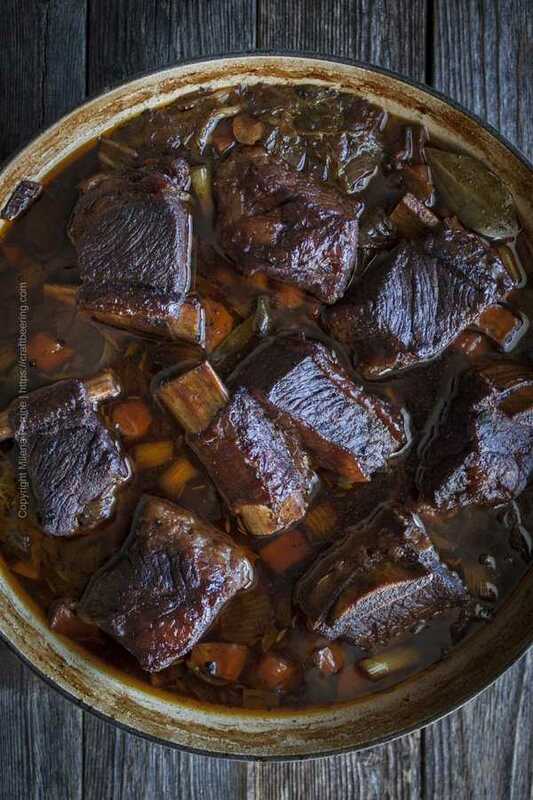 Finally – add the short ribs back to the pan (right amidst the braising mixture you created), cover with a lid and place in the oven to cook low and slow until they become ultra tender. When are the Short Ribs Done? Doneness is determined solely by how tender the meat is. 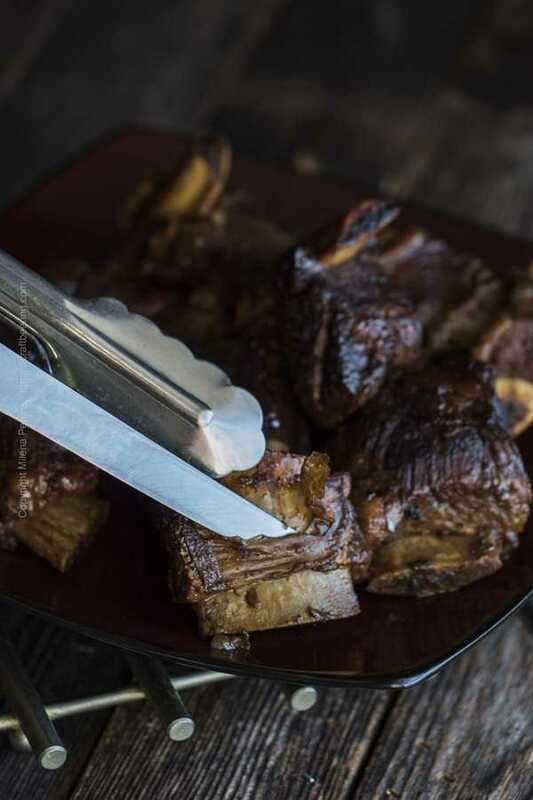 Do not look for a certain internal temperature because even though the short ribs are technically cooked and food safe above 145 F, they will not yet be tender and succulent. Cook them until they are. Test with a fork and if they feel soft and you can easily pull away a small piece and like what you see, who cares that the internal temp has gone up to 200 F? In general, about two and a half to three hours of braising is required but there are many variables to consider – how much meat you have, the calibration of your oven, etc. When they are done they will look like these below and the fat rendered during braising will float on top. Do not fear the fat. 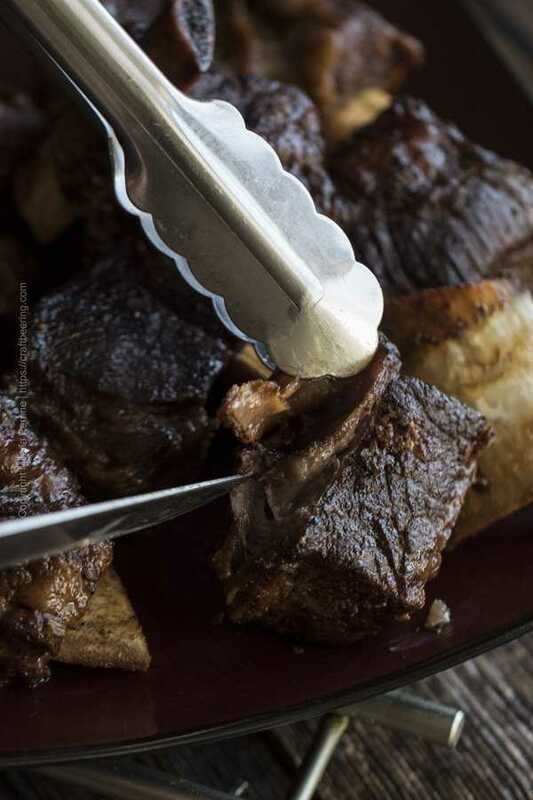 Once you have taken the short ribs out of the oven you need to carefully remove them from the pot and let them rest a bit. Remember, they will be fall-apart tender at this point. Use kitchen tongues and place them on a large plate or cutting board with a lip (to collect juices). You will then be able to work on removing the tendons and bones. See under recipe card. The braising liquid (which smells absolutely delightful by the way) is a precious flavor bomb you can exploit further. With the help of a large spoon skim off and remove as much of the fat floating on top as you can. Scoop out the vegetables and discard them. Next strain the braising liquid – set up a sieve over a sauce pan or other container and pour the liquid in through the sieve. 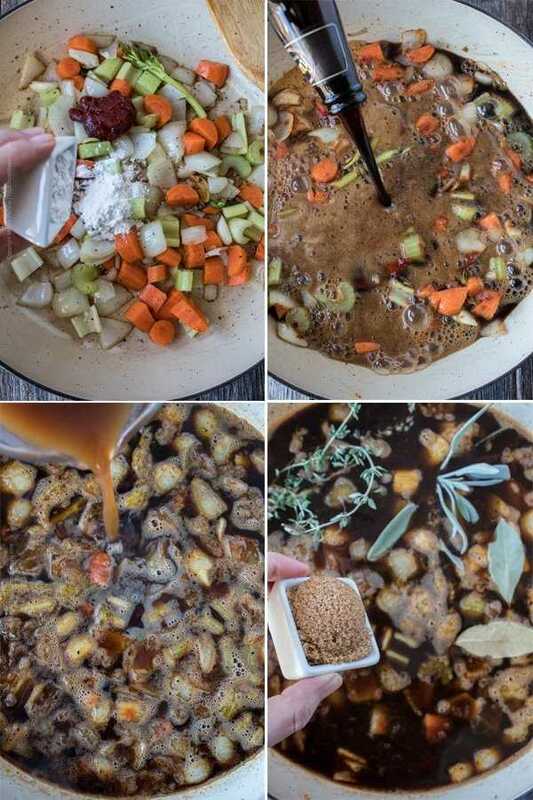 From there you have two options – you can make a gravy with the strained braising liquid or you can save it to use for something else. If you choose to make a gravy, refer to the two easy steps in the recipe card on how to quickly prepare it. 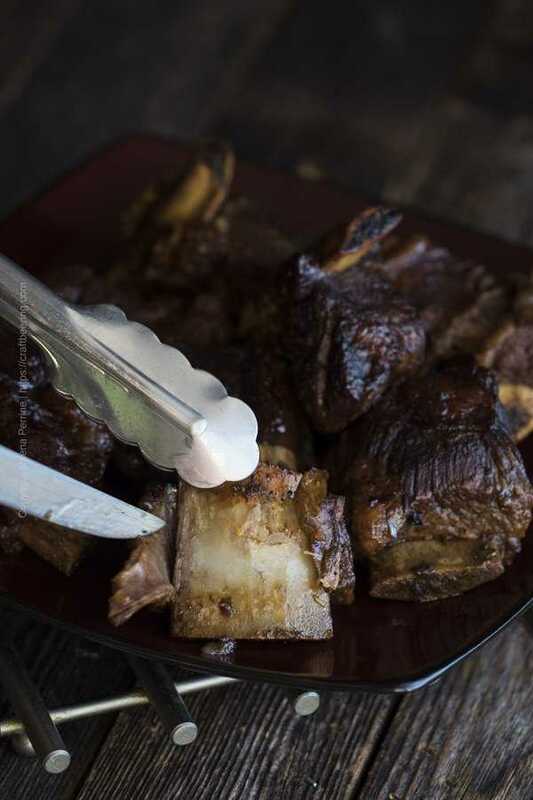 Then place the short ribs (bones removed) back into the gravy liquid, warm them up over the stove or in the oven, garnish with a bit of fresh thyme or parsley and they are ready to serve family style or plate individually. If you choose to save the braising liquid – freeze it in an air tight container or a gallon sized plastic bag and thaw it before you cook something else. 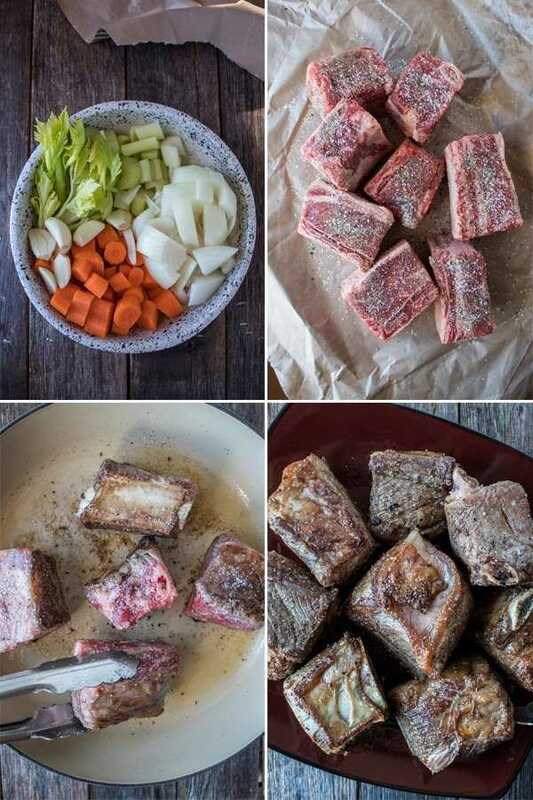 IDEAS: Add the thawed liquid instead of beef stock the next time you braise short ribs, the layered flavors that will develop will be even deeper. This is tried and true – Chris regularly saves and freezes sizable containers of strained braising liquid at his restaurant to use next time. His braised ribs always receive praises for their incredible depth of flavor. Or you can use the reserved liquid to cook lentils or add it to chili or steak soups. 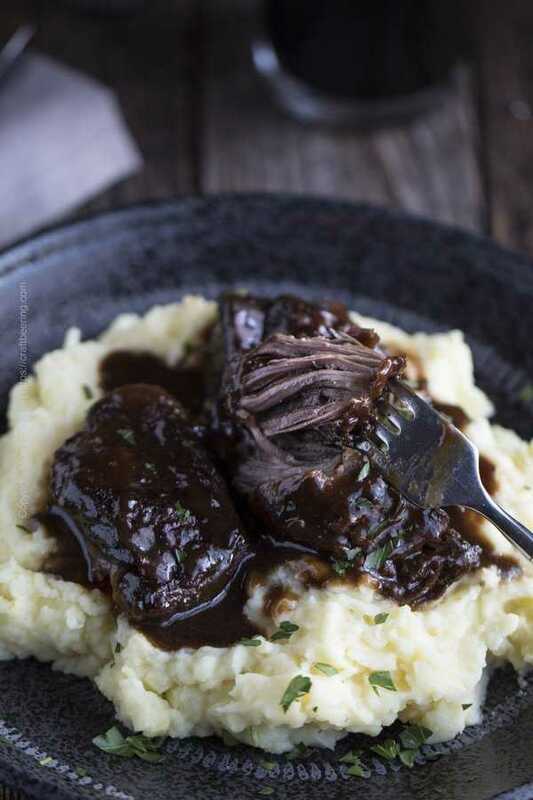 This time we made a luscious, deep colored, incredibly delicious gravy to smother the short ribs with. 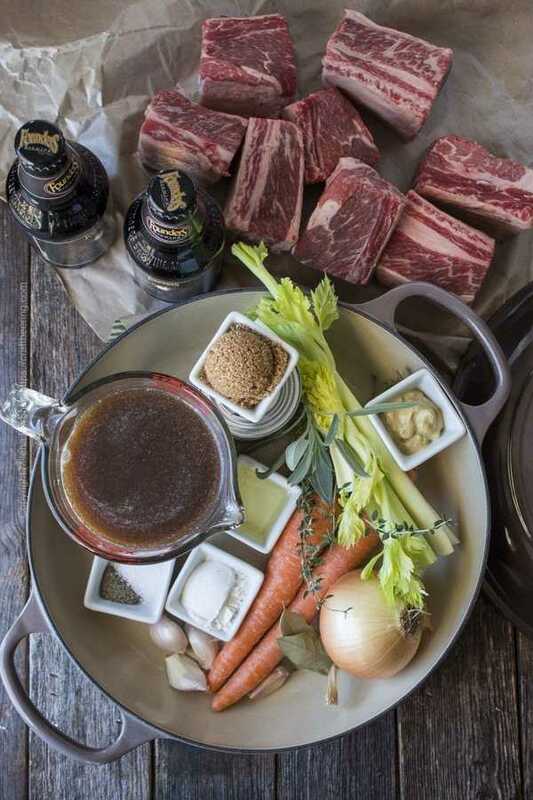 What to Serve with Beer Braised Short Ribs? If you made a gravy – our top choice (and we think you will agree) is mashed potatoes, followed by rice. The meat will be ultra tender and juicy. 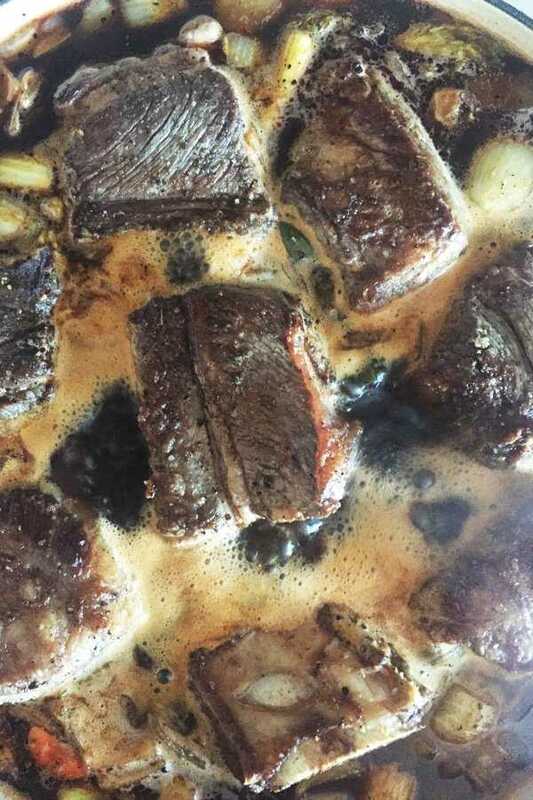 Succulent beef short ribs braised in a rich and flavorful liquid with roasty, malty undertones from dark ale. When done, the beer based braising liquid is converted into a decadent, luscious gravy. Preheat your oven to 275 F.
Clean and rough chop all the veggies and set aside. Pat dry the ribs and liberally season with salt and pepper on all sides. 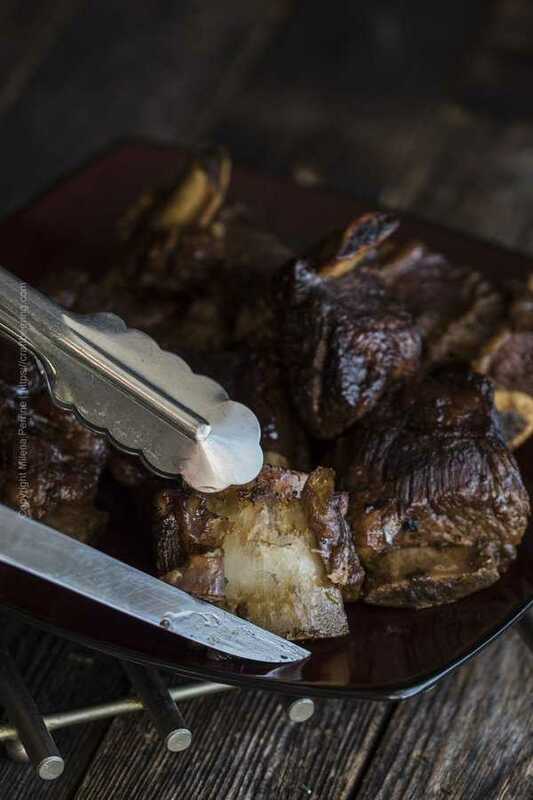 Over medium-high heat the cooking oil in a braiser/Dutch oven or large heavy skillet and sear the short ribs for about 1-2 mins on each side. Work in batches so that you do not overcrowd the pan. When nicely browned, remove the short ribs and set aside. Lower the heat to medium, add the veggies, stir them and let them soften for a few minutes. Add the flour and tomato paste (if using) stir and cook for about a minute. Deglaze by adding the beer and be sure to scrape all brown bits from the bottom of the pan. Add the beef stock, the bay leaves, sage, thyme and stir in the brown sugar. Add the short ribs, distribute evenly and increase heat to bring to boil. Once boiling cover and place in the oven for about 3 hours. The ribs should be very tender before you take them out of the oven. Use a large, heavy skillet and complete steps #2 thru #5 from the Braiser/Dutch oven method above. Very carefully transfer the braising mixture and the ribs to your slow cooker and cook on low until they reach your desired tenderness. If you want to make a gravy from the braising liquid first scoop out the vegetables and discard them. Using a large spoon skim off and remove as much of the fat floating on top of the liquid. Then strain the braising liquid using a sieve. Heat a pan***over medium heat, add the strained braising liquid and the Dijon mustard and bring to simmer, mix to incorporate, add slurry and stir to thicken. **To remove the tendons and bones follow the step by step instructions under this card. ***You can use the same pot/pan in which you braised the ribs and then add the ribs back to serve family style. It is much better etiquette to remove the tendons and bones before serving the ribs. Steady each rib by holding the top of the bone and slide a knife underneath the outer side of the tendon wrapped around the bone. Remove the bone by simply lifting if with the tongues (maybe also pressing the meat down gently with the knife). It will come off easily. Next turn the meat over and gently pull on the tendon attached to the meat. It will literally peel off without any effort on your part. That’s it! 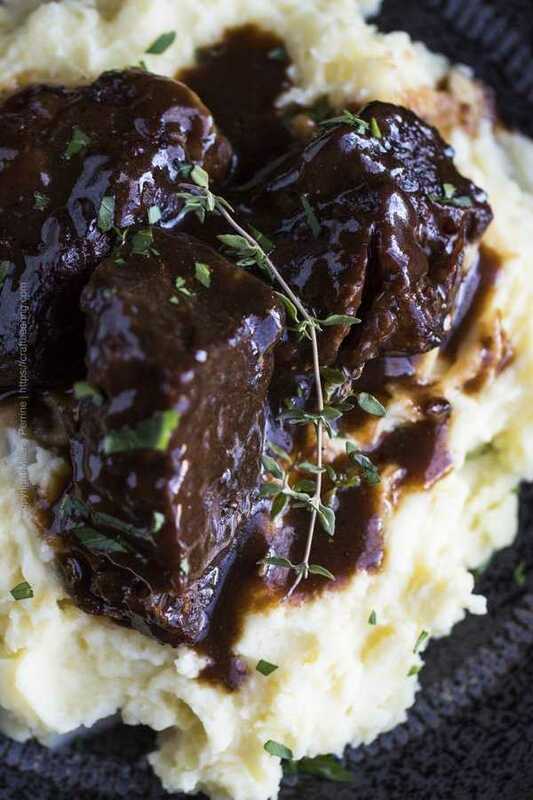 Do it with all the short ribs and proceed to enjoy them. 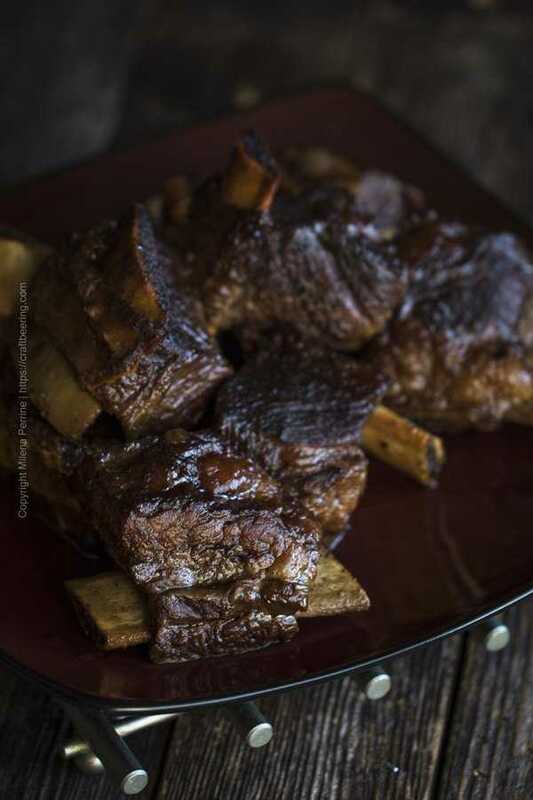 I love short ribs, and these look like perfection! 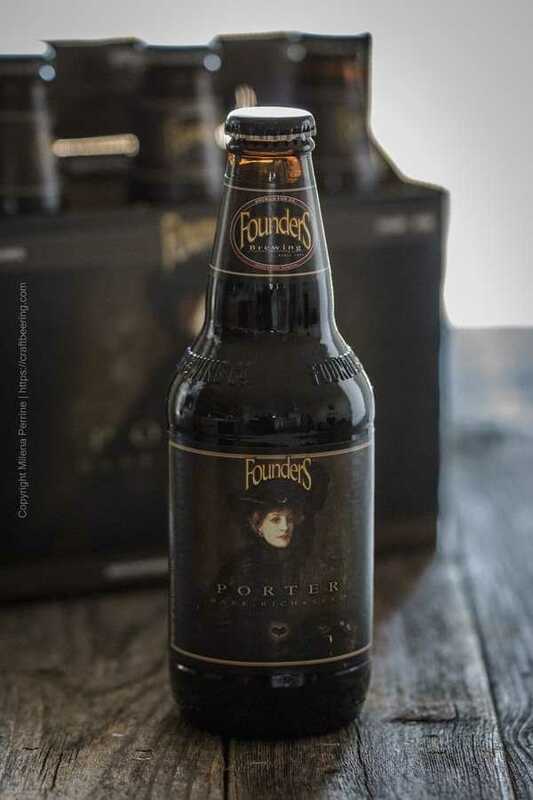 I can’t get that porter, but my husband’s favorite beer is Guinness or, when we’re out, the “darkest beer you have!” So I know he’d really love this recipe! Merry Christmas! Thank you, Mimi! Dark does it:) Merry Christmas to you too! The further along I moved through this post, the louder I kept saying, “OH MAN! !” This recipe is a keeper! Short ribs are in my top 5 favorite meals of all time!! Beautiful! This whole thing just looks insanely delicious! So rustic and screams comfort all over! and btw, I’d be more than happy to eat the tendon 🙂 You know we Asians eat weird stuff ha..ha..! My grandma too! She would have enjoyed the tendons, especially cooked like this:) Thank you, Marvellina! I think these would be perfect for Christmas Eve dinner! They sound so cozy and warming, just the kind of meal I like this time of year. Have a great week! Thank you, Kelsie! 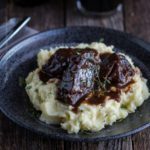 I agree – braised ribs are an easy choice for whenever you don’t feel like doing too much in the kitchen and would rather spend your time enjoying cocktails and snacks with your family and guests. Delicious and I am proud of making them myself! Saw these last night on Facebook, got short ribs today and the in-laws, the hubby and I just polished off a delicious meal. I used two oatmeal stouts and total of twelve short ribs (a little more than what it says in the recipe) Cheers and thank you for sharing your recipes!